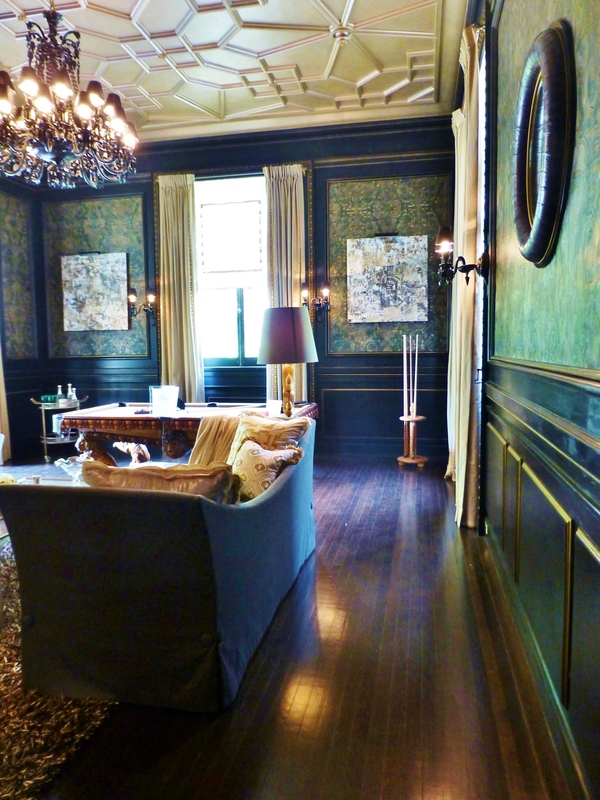 Black crystal lighting coordinates beautifully with the black paneling, highlighted with gold leafed moldings. Hello everyone! Today we’ll continue our tour of Blairsden, the Mansion in May. In this installment, we’ll focus mainly on the Billiard Room, designed by Bjorn Bjornsson Interior design. Luxurious finishes are found throughout this room, from the embossed leather wall-coverings, to the black paneling with gold-leafed details. I love the mirrored over-mantel with a majestic portrait mounted on top! According to the ‘Journal’, or program guide given to visitors, Mr.Bjornsson wanted to create an intimate setting, even though the space is rather large. Much of the architecture in this room is original to the space: the ceiling, the paneling, and of course, the beautiful green leather embossed wall-covering were already in place. Bjornsson featured an antique billiard table with an adjacent sitting area in front of the grand fireplace, and incorporated many custom-made and fine details in the space, including furniture with unique fish leather from Iceland, and custom embroidered window treatment fabrics. In this photo, you can appreciate how the light-colored draperies and pillows contrast beautifully with the dark walls. 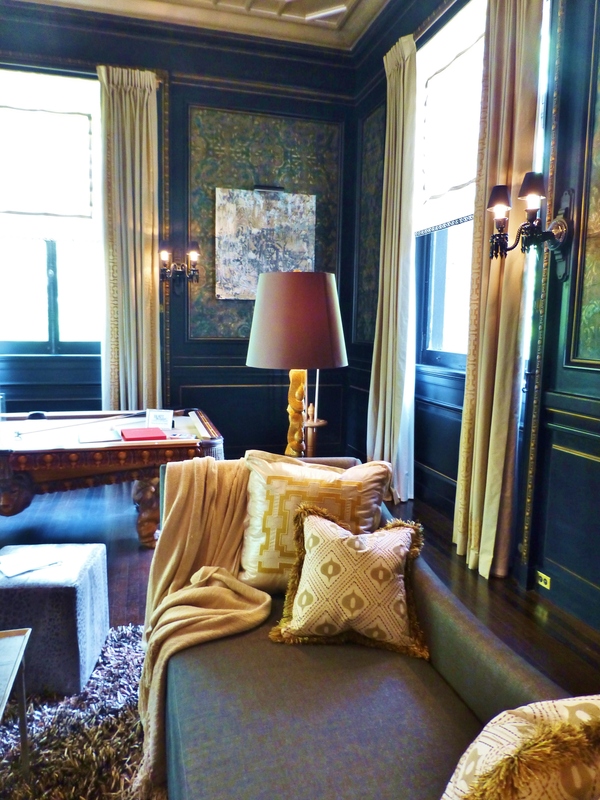 The designer chose to use gold accents, which enhance the gold leaf detailing of the paneling in the room. Notice the shaggy textured rug and brush fringe on the pillows–both of which update the space. Not to be overlooked is the amazing 24-light black Zenith chandelier from Baccarat with its coordinating sconces. 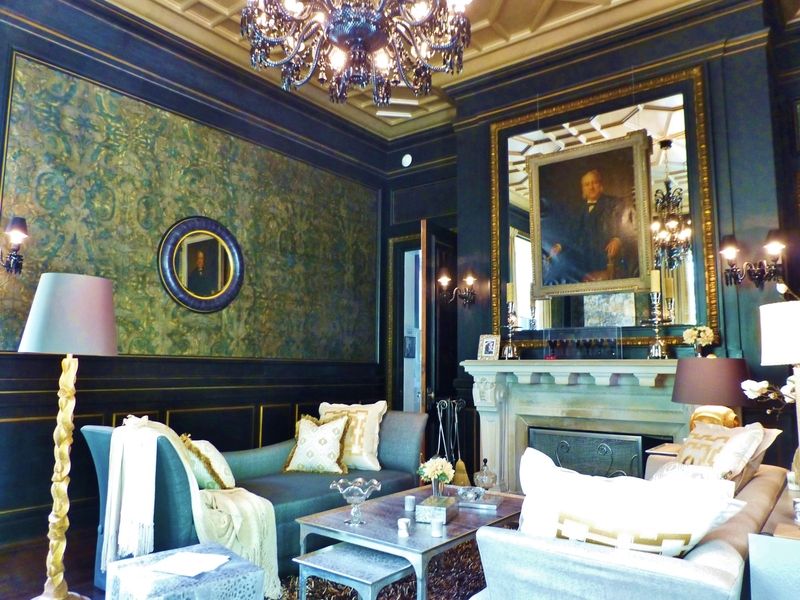 The black crystal coordinates beautifully with the black paneling, highlighted with gold leafed moldings. While you’re checking out that amazing chandelier, let your eyes wander around the ceiling at the gorgeous details there…isn’t that original fretwork patterned ceiling just fantastic? The enormous Baccarat chandelier has 24 lights and is made of black crystal. Notice the coordinating sconces found throughout the room, as well. 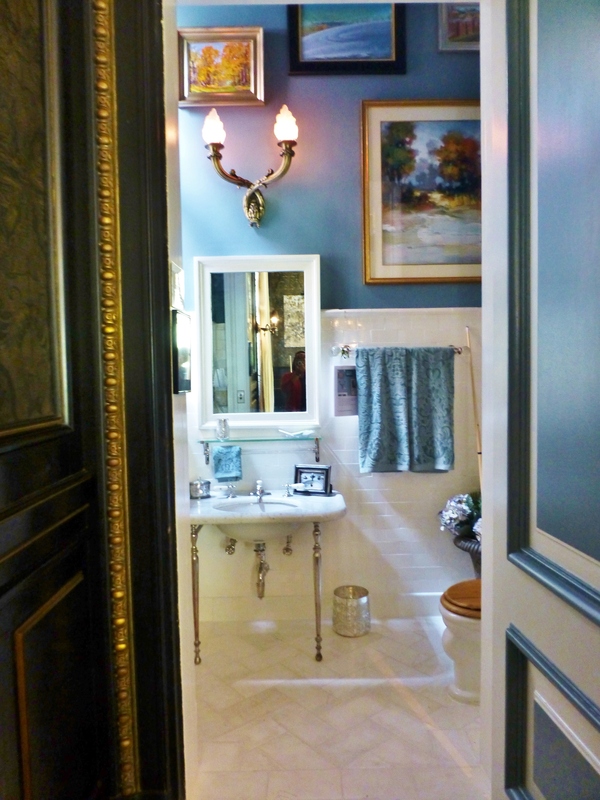 An adjoining powder room is also worth mentioning. Plainfield Restoration & Reproduction LLC is responsible for the transformation of this space. They restored, re-plated and polished all the original fixtures, keeping the room true to its architectural period. Randomly placed marble floor tiles were reconfigured when the company salvaged, recut and polished the original tiles and re-laid them in an interesting symmetrical herringbone pattern, giving the room more depth and interest. The wall colors and fabrics were chosen to bring the rich feel of the Billiard Room into the Gentlemen’s Wash. I love the gallery wall of colorful artwork, which goes all the way to the ceiling in this small space, giving it an expansive feel. Please take the time to leave me a comment about the rooms featured in this week’s blog–did you love the moody Billiard Room with its embossed leather walls? And what did you think about that wonderful renovation in the Gentleman’s Wash? Stay tuned for much more about the rooms in Blairsden: The Mansion in May. Until then, please tell everyone you know about Kristine Robinson’s Blog, I need all the friends I can get! This entry was posted in Architecture, Designer House, Home Decor, Interior Design & Decorating, Uncategorized and tagged Billiard Room, Chandelier, Decor, Draperies, Fabric, Furniture, Interior Decorating, Interiors, Mansion in May, powder room, rugs, Wallcoverings. Bookmark the permalink.